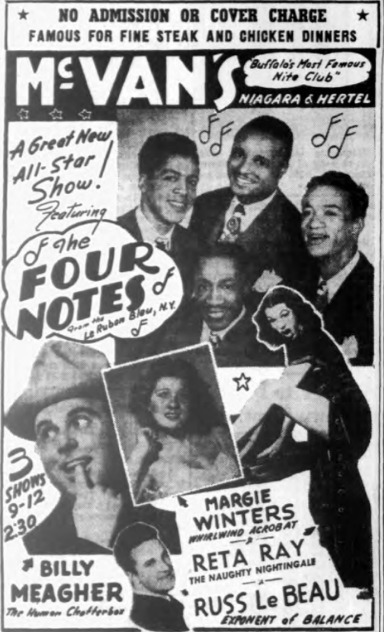 Above: The Four Notes, who consisted of Tommy Adams, Frederick Johnson, Gene Smith, and James Sapp. 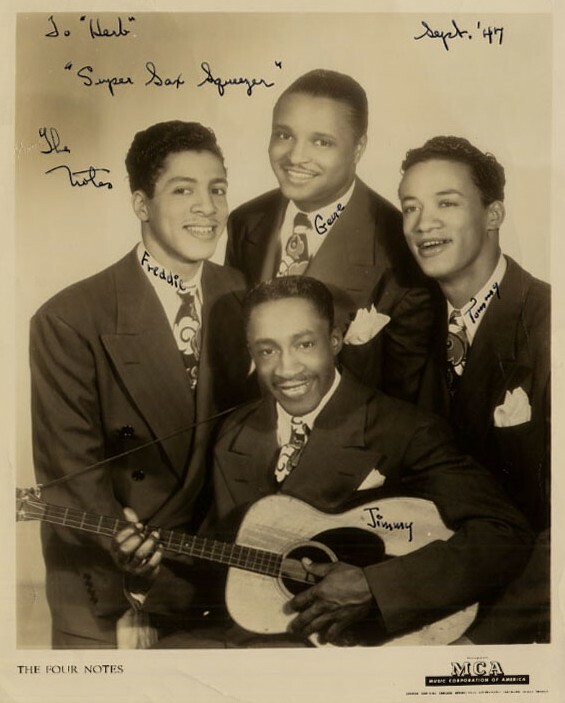 Per Marv Goldberg: In 1946 and 1947, Frederick Johnson was in and out of the group, eventually taking the full-time place of Eugene "Bunny" Walker, who'd wandered off to join the 3 Riffs. That fourth position was the volatile one. Tommy Adams, James Sapp and Gene Smith (aka Richard Eugene Smith) seemed to always be there. But Eugene "Bunny" Walker, Frederick Johnson, and later Henry Oliver "Ollie" Jones held down fourth place. The group had been around since at least 1943. 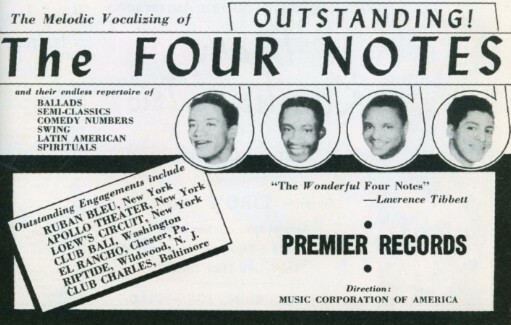 Above: Promotional clipping for The Four Notes from Billboard 1946-1947 Annual Edition. 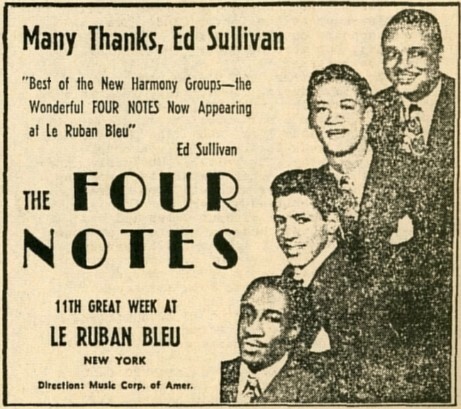 Above: Another promotional clipping for The Four Notes from Billboard June 1946. Above: From Buffalo Courier Express dated 8/1/46. 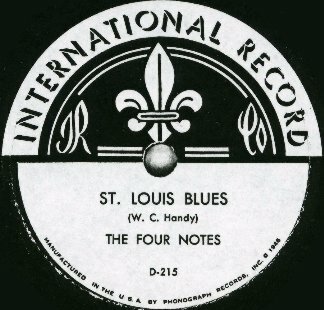 Above Left: Photo of The Four Notes from about 1946. Lead singer Gene Smith is at top. 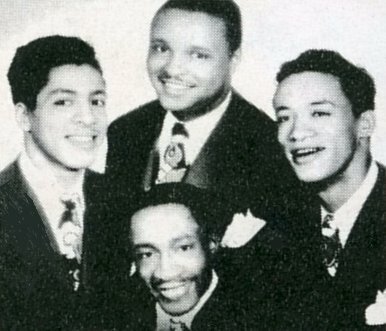 Tommy Adams, who later was with The Blenders, is at right. Above Right: Label image for Paradise 115. This was a Detroit label owned by Mrs. Delmar Ray. 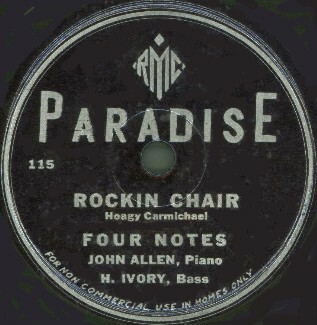 The Four Notes had two releases on Premier (1945), four on International Record (1946) and two on Paradise (1948). 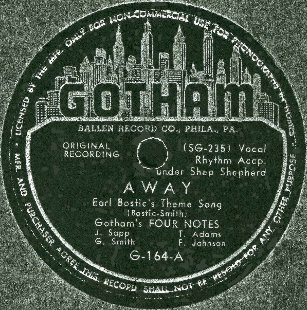 They also had one release on Gotham as Gotham's Four Notes (1948), probably from masters leased from Paradise. A) Click on an option below to listen to The Four Notes using Streaming RealAudio. B) Click on an option below to listen to The Four Notes using Downloading RealAudio.